Spending the hundreds of hours we do on Facebook, we are constantly noticing new things here and there. 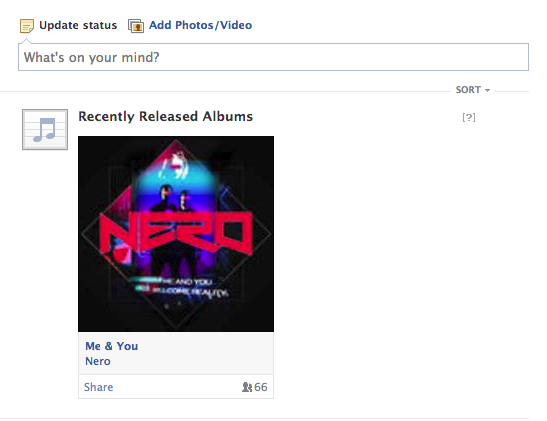 Today I was greeted by ‘Recently Released Albums’ section on my newsfeed. It recommended an album of an artist I ‘Like’ and may have listened to on Deezer (the app linked to the block). After clicking on the album, I was asked to launch Deezer and then could listen/buy the album. Excellent news for music enthusiasts like myself! All in all I think this is a great way of opening music discovery and boosting sales and usage of music apps. Coupled in with Spotify’s growing agreements with Music Industry bosses… I see music becoming quite a bit more social in 2013. Prev:Run Magento? We have an early gift for you! Next:Easy Privacy Settings rolled out on Facebook. Have you changed yours?